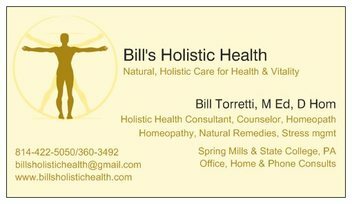 Bill's Holistic Health is your place for a natural, holistic approach to health and well-being. It embodies Homeopathy, Herbals/Gemmotherapy, Tonics, Nutrition and Stress Management. My belief is that you should be able to maintain a high level of health, wellness and vitality throughout your life. Using a holistic approach, all aspects of you and your life are taken into account. The approach used is to strengthen your weakened systems, help to increase your vitality and boost your body's own healing systems. Through stimulating and strengthening your own systems, the body can come back into balance and bring about greater levels of health and vitality. With a holistic approach to healing using a variety of modalities in all aspects of one's life, greater levels of energy, vitality and health can be attained and maintained. HOMEOPATHY: This is the use of natural remedies to stimulate the body's systems.It involves strengthening the body and stimulating the innate healing system. Remedies are made from natural sources and are safe and non-toxic. Homeopathic remedies are used for acute problems and chronic issues, including physical, mental and emotional issues. CERTIFIED CEASE THERAPIST: This is a system of working with individuals with Autism Spectrum Disorder. HERBALS: Herbals are used in natural healing. They can be used for a specific organ, system or for the whole body. GEMMOTHERAPY: Gemmotherapy is the use of plant stem cells, particularly the buds, young shoots and roots. They are used to help detoxify the body, drainage and clearing out of dead material. TONICS: Tonics are used to help tone up an organ or a system. They are made typically from herbal tinctures and also other natural sources such as minerals. They can help to target and strengthen specific areas where an individual may be weak or injured. NUTRITION: What one eats has a great effect on one's health. Nutrition is emphasized as needing to treat one's body with the utmost respect by honoring what one puts not one's body. There is not one diet for everyone...but it is important when healing that one's body gets the essential nutrients and does not have to do extra work getting rid of toxins from foods. STRESS MANAGEMENT: Being able to deal with all of the stresses of daily life are crucial to maintaining good mental and emotional health. Stress management techniques are taught so individuals can put into practice all that is needed to be able to deal with stresses of daily living. With a multi-modal. holistic approach to health, greater levels of health and vitality can be attained and maintained. Please acknowledge and understand that information on this site, or links to other sites is for informational purposes only and is not a substitute for medical care by a qualified healthcare provider. Bill Torretti is not a Medical Doctor. He does not diagnose or prescribe for medical conditions. If you think you have symptoms of a medical condition please seek medical help from your physician or medical provider. Welcome to Bill's Holistic Health. I will be conducting mindfulness stress reduction classes starting Tuesday, March 12, 2019, 6:00-8:00pm in State College. Remaining Classes meet Tuesdays March 19, April 2, 16, 30 and May 14. The Mindfulness Stress Reduction class meets at 611 E. Prospect Ave, State College, PA. Call 422-5050 for more info or click below. My blog now has its own page. It is a reprint of some general suggestions for staying healthy during the cold and flu season. There are a variety of symptoms and they may vary widely. This really calls for individualization when looking at what may benefit a person. The best defense is a good offense. I keep looking at the importance of diet and nutrition in staying healthy and the diet of many people does not appear to be helping them stay healthy. I want to once again stress the importance of eating healthy, especially during the upcoming fall and winter months.